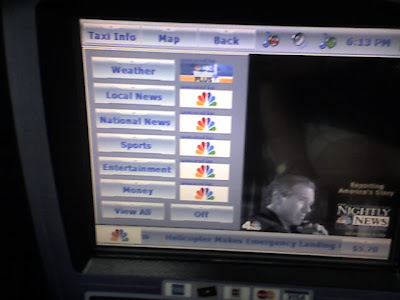 TV and Credit Cards: In Taxis! 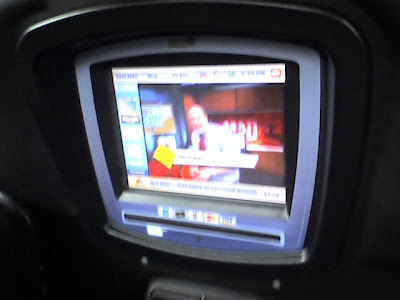 While heading home from the wedding I attended this weekend, I had my first ride in one of New York City's TV-equipped cabs. These have been in the news lately, as of course not everyone thinks they are a good thing! So what are they? 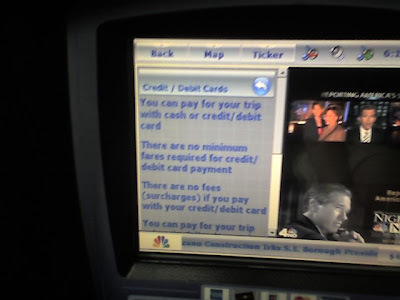 Facing the passenger in the back seat, there is a touch-screen with a slot for swiping a credit card. 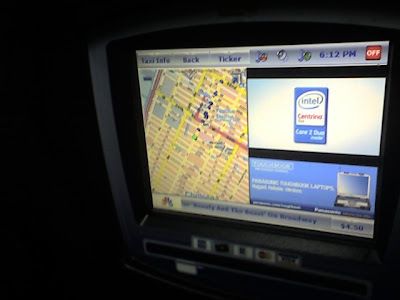 You can tap the screen to select various options: yes that is Jim Cramer above, but you can also watch news, read taxi information such as the Passengers' Bill of Rights, and view your cab's current location on a map of New York City, via a GPS system. The fare meter amount is visible in the lower right corner of the screen. The system also shows advertisements. You can tap the screen to adjust the volume, and there is a red button in the upper right corner that says "off," though when I tapped it, nothing happened. I played around with the unit for a little while, and snapped these photos with my Treo. Soon enough, the driver asked me what I thought of "the new technology." He told me that most of his fellow cab drivers hate it. 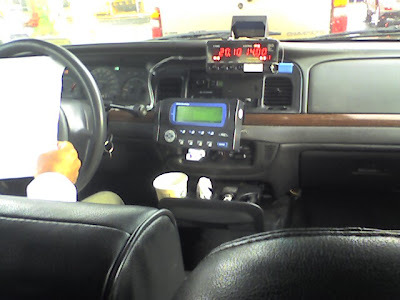 My driver doesn't own his cab-- he leases it from a taxi company. He pays $118 a day to drive his cab for 12 hours. (His cost goes up to $132 a day for the busy Thursday-Saturday period. Also, if he returns his cab 20 minutes late, he has to pay a $20 fine.) Cab drivers also have to pay for their own gas. It's easy to see why drivers need to keep their cabs full of paying customers, preferably ones who take lots of short, fast trips. On a slow day, they might end up with $50 in their pockets after covering their expenses. The leasing company owns about 400 taxis, and according to my driver, less than 50 of them were leased this morning, as a kind of strike against the new TV system. I don't know if there is really a widespread strike going on, but I had read that taxi drivers don't like the credit card system, because people sometimes swipe their cards and get out of the cab before the driver can discover that the card is declined. Some also think the GPS monitoring is an invasion of privacy. Some cabbies are also just finding the system difficult to use. 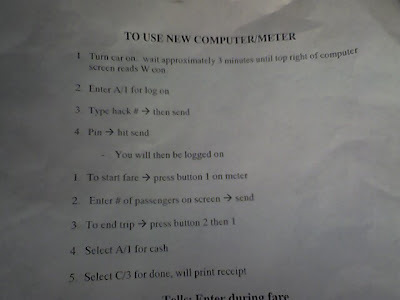 My driver showed me the instructions he'd been given: a one page sheet with a few basic steps. I helped him figure out how to enter the extra charge for a toll, as my preferred route took us through the Brooklyn Battery Tunnel, which costs $4.50. Unfortunately, the driver entered the toll amount as $14 in his little electronic keypad, and we couldn't figure out how to correct it. Again, this guy's livelihood depends on speed-- he doesn't have time to sit there fiddling around trying to figure out how to enter information into a computer. However, he did acknowledge that the system is "the future," and thinks it will be a good thing once they work out a few bugs and get all the drivers properly trained on how to use it. In the end, I didn't get to test out paying via credit card. Because the toll amount had been entered incorrectly, my total fare was shown as $39.60 instead of $29.60. I didn't really want to give the guy a $10 tip, and also worried that he wouldn't really get the money because of the toll error. So I ended up giving him $37.00 cash. That is a slightly bigger tip than I usually give cabbies, but having gotten this glimpse into the economics of his work day, I felt bad that we'd gotten stuck for 5 minutes while a bridge opened up to let a barge go up the Gowanus Canal. I also figured I owed the guy a little something extra for giving me some good blogging material! Bronx Chica...wow they really are upgrading taxis! I don't remeber the last time I rode in a taxi. Oh nice pics with your treo! 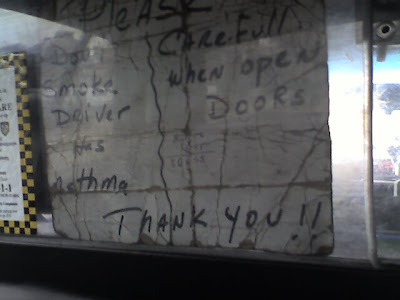 I don't take taxis that often, maybe once per year. However, I have been reading the news alot with all the issues cabs have with the new system. I have always wondered in the past why yellow cabs especially in manhattan did not take credit cards. I was chatting with a cabbie a couple of weeks ago who was telling me he just *hated* the new system--listening to the noise all shift, mostly. He taught me to turn it off; it requires a really quick tap to the "off" button, apparently.